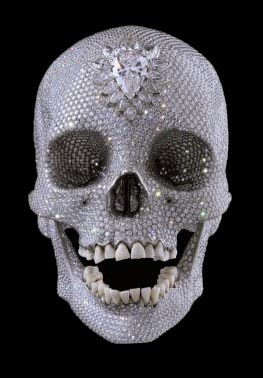 Damien Hirst's diamond skull is a life-size cast of a human skull in platinum, covered entirely by 8,601 VVS to flawless pavé-set diamonds, weighing a total of 1,106.18 carats. It did remind me of the Jericho skulls. Jericho is the oldest known city, 8500-7500 BC. and only in the 50's, a huge discovery was Jericho's plastered skulls - it was a replications of the deceased sculpted onto the skull. It was an ancestor-worship. The residents of Jericho buried dead family members under floor of household. 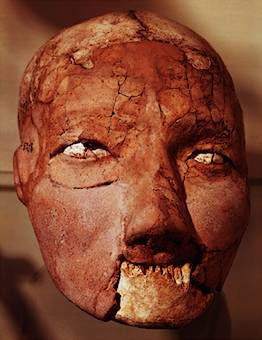 This skull from the site of ancient Jericho is covered with molded plaster and has eyes of shell. I am wondering what the previous 'owner' of the diamond skull would say about this 'art'?! "How Art made the World"
Harhar. I should stop educating you. Miss Smartypants!